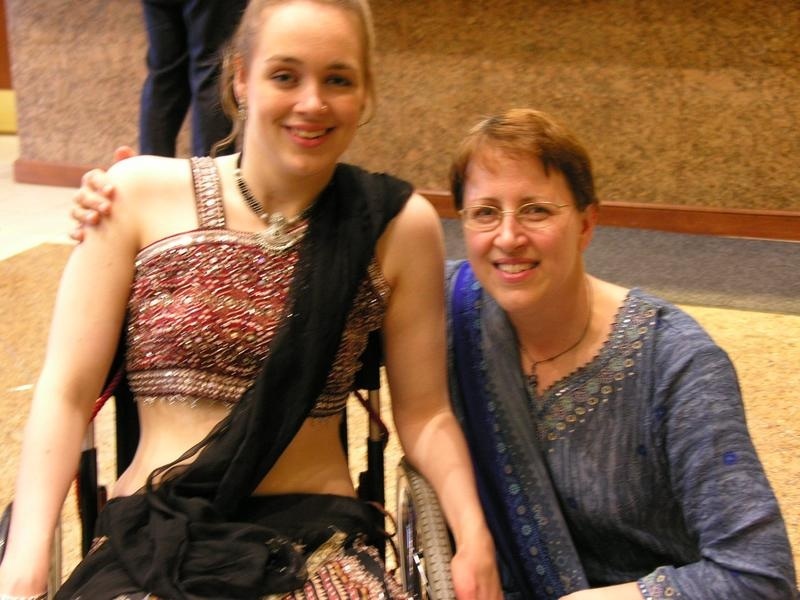 On her blog Struggling with Serendipity, Cindy Kolbe documents the journey she and her daughter, Beth, took after Beth sustained a spinal cord injury in May 2000 at age 14. I drove back from my son’s college concert near midnight. Exhausted, I glanced at my 14-year-old daughter, Beth, asleep in the passenger seat. We were only 10 minutes from home. I thought I could make it without falling asleep. Then I heard a road sign flatten on concrete. As the car flipped three times across a bare Ohio field, we left behind an ordinary life. Later, when I arrived, Beth lay flat in a maze of tubes and wires, her pretty face swollen, her neck in a brace. She greeted me with a small smile. Her usual upbeat attitude was muted but present–I should have felt gratitude for that, but I didn’t. In disbelief, I stared at the girl in the bed. How could she smile? When Beth slept, a surgeon guided me to a chair. He was kind, but his words were devastating. The bones in her neck were shattered. After surgery, he told me that her spinal cord was severed at the C6-7 vertebrae. With all four of her limbs damaged, she was now a quadriplegic who would never walk. The loss of hand function seemed especially cruel. Her fingers didn’t work and her muscles began to shrink (atrophy). Among many health risks, pneumonia stood out as a leading cause of death for quads—along with suicide. With one mistake, I had hurt everyone I loved. Whenever I closed my eyes, I saw the upside-down car and Beth slumped over her stomach on the ceiling, her neck at a disturbing angle. The image haunted me. How easy it would be to lose myself under a blanket of guilt. Instead, I focused on small moments. Beth needed me. I turned her to the side, straightened a sheet, adjusted a pillow, and stayed in sight. Sleepy, in a morphine haze, she told me, “I like it when you hold my hand.” Crying quietly, I could not make myself grateful for the partial feeling in her hands. When Beth was transferred to rehab, we shared a room with a girl in a crib with high sides who made sad sounds. She was alone with a brain injury. We met a man with a spinal cord injury who needed a ventilator to breathe; he moved only his head. A teenager with paraplegia refused to get out of bed and moved to a nursing home; he had full use of his hands and arms. As physical therapy started, Beth lay face down on her stomach, unable to lift her shoulders off the mat. Her body was moved for her. She had no strength. The therapy session finished with the difficult process of transferring her into a wheelchair. Beth opened her arms and I leaned into a hug. Her bent hand softly patted my back. Suddenly, I was grateful for arms and wrists that move. For lungs that breathe. For her ability to feel me pat her back in return. After a month in rehab, Beth tried to sit up on the mat. She started on her back and concentrated on throwing one arm over the other to roll onto one side. It took several tries. She pushed down with her hands to raise her upper body incrementally to a shaky sitting position for the first time. Her body tottered back and forth in a battle of balance–Bambi on ice. My instincts screamed to help her, support her. Instead, I turned away to wipe my eyes. She leaned forward and planted a hand on each side to steady herself. She looked up and smiled when she heard me clapping with the therapists. Even Beth seemed surprised by, and glad for, every small thing. My daughter insisted on starting her freshman year of high school on time about three months after her injury. On the first day, she pushed herself slowly down the halls in a manual wheelchair. Four years later, she was able to independently care for herself and live in a dorm or apartment with no assistance, a rare feat for quads. Beth’s attitude propelled her forward with me in tow. Little by little, I chipped away at my millstone of guilt. Sometimes we need someone strong to lead the way. Cindy Kolbe is a lifelong disability advocate who lives in Summerville, South Carolina. She managed group homes in Ohio and ran a nonprofit in Massachusetts. Her daughter Beth graduated from Harvard and Stanford Law and is employed as a health policy lawyer in Washington, D.C. Access her Blog and reach her via email.